Four Carmelites decided to make a home in Reno and we became Carmel of Reno. 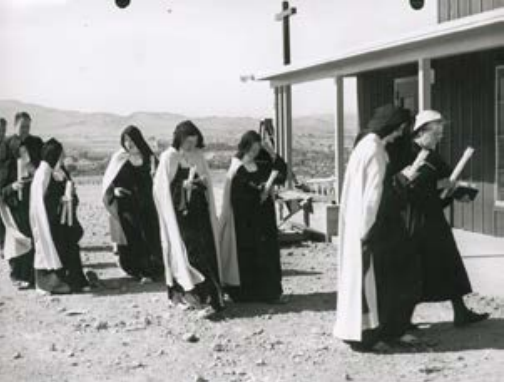 On August 12, 1954, four nuns holding one-way tickets for Reno, Nevada, left the Carmelite Monastery in Indianapolis. The next four nuns followed a few days later, and our Carmelite life took root in a small house on 829 North Virginia Street on the Feast of St. Bartholomew. Bishop Robert J. Dwyer, delighted that his invitation had become a reality, encouraged us in our search for land to build a permanent monastery. In time, nineteen acres were purchased in southwest Reno and we moved into our new monastery in 1958. This stage of our journey was well in place when four years later, the Second Vatican Council opened, calling the whole Church to renewal. Over the next years, and even now, we continue to pray, study and work to incorporate these teachings into our lived experience.